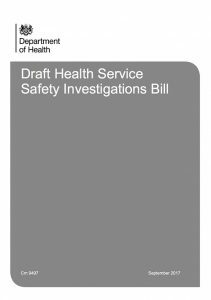 The draft bill proposes setting up the Health Service Safety Investigations Body (HSSIB). The HSSIB will conduct investigations which focus on learning from patient safety incidents in the NHS, to reduce health care harm and improve patient care. The draft bill allows the HSSIB to conduct investigations using ‘safe space’. ‘Safe space’ is a set of legal powers that prevent the HSSIB from disclosing the information it gathers in the course of an investigation.